Frankenstein, Agent of S.H.A.D.E. Vol. 1: War of the Monsters collects the first seven issues of the series, written by Jeff Lemire and drawn by Alberto Ponticelli. Frankenstein has been a DC character for a long time: his most recent revamp was in Grant Morrison’s Seven Soldiers of Victory series, and that is the version used here. It’s a potent mixture of high tech and monsters: absolutely crazy mad science. The action just keeps ramping up. The first issue starts with a monster attack. 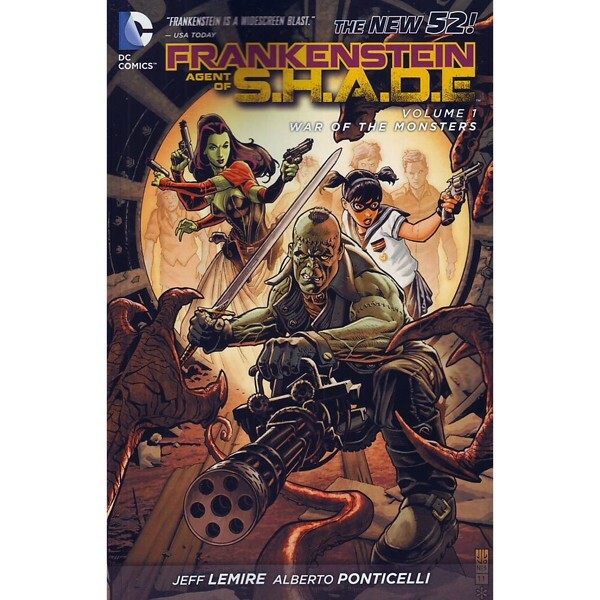 By the end we’ve met Frankenstein and his new group of Creature Commandos, seen the S.H.A.D.E. headquarters, and the team has begun battling a town full of monsters. A portal is discovered under the lake, which takes the battle to an entire planet full of monsters. Turns out each kind of monster has a Titan that spawns them…it’s a lot like bosses in a video game battle. In addition to the nearly nonstop action, the series is also notable for its humor. The team is constantly making wisecracks, and team leader Father Time has taken the form of a little girl with pigtails, a sailor suit, and a mask. The tone reminds me of Doom Patrol, another long-standing DC series which has been surprisingly absent in DC’s New 52 so far. 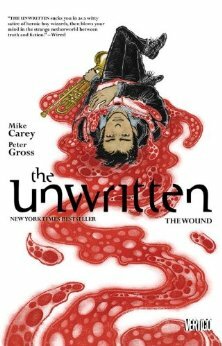 The Unwritten Vol. 7: The Wound picks up after Tom Taylor’s confrontation with the Cabal. The first issue (“The Wave”) shows the results in the land of story, via our old friends The Tinker and Pauly the rabbit. All of the worlds of fiction are disappearing as they are overtaken by the Wave, which brings the whiteness of an unwritten page to everything it touches. Back in our world there are also repercussions. Stories seem to be disappearing here, as well, which leads Tom to go on a speaking tour to read stories to large audiences in an attempt to get them to take root in human consciousness once more. One of the other notable things is the rise of the Church of Tommy, which seems to be responsible for the mysterious disappearance of some of its members. Tom and the Church finally meet at an Australian speaking engagement, with dramatic results. Let’s just say that the Church appears to be out of the story from now on. The final issue (“Puppet Masters”) is a prequel to the title story arc. It tells how Tom and Richie recovered from the epic battle, and the hard truth Richie discovers in the process (which leads him to perform some storytelling magic of his own). 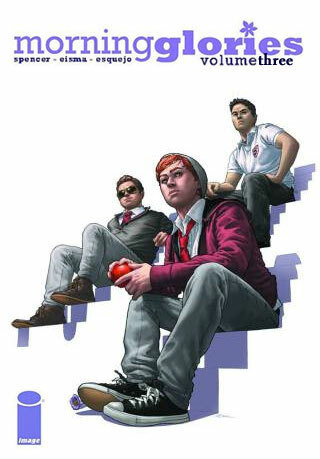 Morning Glories Vol. 3: P.E. finally really begins to draw several story lines together. The time travel aspects of the story still tends to give things an “anything goes” feel. But at least some of the time travel incidents are starting to be tied together logically. While I was beginning to lose patience at the end of the second arc, I’m now starting to appreciate the long game being played: we see the same scene from different perspectives, and the time sequence is not always linear. Sometimes it happens almost right away, but it can also be delayed for several issues. This arc shows us what guidance counselor Ms. Hodge had been up to when she returned to the school back in Issue 12 at the end of the second arc: that scene turns out to be a telegraphed ending to the central action in this third arc. There appears to be some disagreement about how to bring the “better future” (which has been mentioned several times) to fruition, and this may well turn out to be the central driver of the series. Another side-effect of time travel is that it tends to make deaths look provisional. A character might look dead now, but in the future (or the past) who knows? There’s a dramatic splash page near the end of this arc that shocked me less than it should have, I think, for this reason. Morning Glories Vol. 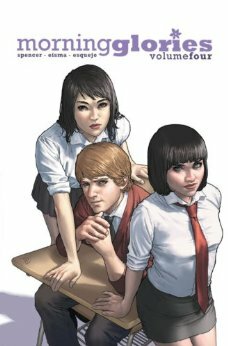 4: Truants brings us to the end of Season One for the series. I’ve seen mention of this in interviews, but it’s not mentioned anywhere in the comic itself, except on the back cover of the collection. The action basically starts up where the previous collection left off, and there are many flashbacks filling in the back story, just as there were in that collection. Issue 25 famously includes a timeline sequence that places events in chronological order. To quote writer Nick Spencer: “Irina’s attempt to kill the Headmaster led to Abraham’s camp being burned which then led to the Glories being admitted to the school and brought there as Abraham was brought there. Then we had the Truants failed attempt to rescue him and how that all played into the story we’ve been telling.” (from a CBR interview) For all of that, I was still a bit disappointed that more wasn’t actually resolved, and the arc ends on a cliffhanger. This entry was posted in DC Comics, Image Comics, Vertigo comics and tagged Alberto Ponticelli, Jeff Lemire, Joe Eisma, Mike Carey, Nick Spencer, Peter Gross. Bookmark the permalink.